Ask anyone and they will tell you that pacing in running events is key. If you go out too hard in the beginning it is likely to cost you later in the race. However, it is often difficult to hold back when the gun goes off as adrenaline is running high, you are surrounded by others, and you probably feel great if you tapered for the race. Add to this the fact that a course can be rolling or hilly and maintaining the optimal pace can be a chore! At the end of 2015, before The Pacing Project existed, I began working with Brie, an athlete who was about to compete in her first marathon. She had been running and competing in triathlon for the past two years, but her training age was still fairly young. After spending some time looking at her past data in the dashboard I decided that a 4:15 marathon (9:44 minute per mile pace) was a realistic and attainable goal. As the race approached we started to talk about pacing and I advised her that she should negative split her effort and to break it up into 10Ks. Her goal pace was 9:40 and I knew it would feel too easy in the beginning but that she needed to hold back as the last half was all uphill and that is when she would be happy that she did. Based on the elevation profile, I suggested trying to negative split her effort. I wanted her to start out the first 10K at her goal pace or slightly easier and warm up. For the second 10k, she would increase her pace just a bit. For the third 10K, which was slightly uphill, I knew she would start to feel the effort a bit. I told her not to stress about pace but rather try to keep her effort steady or slightly harder (not faster) than the previous 10K. For the last 10K, I knew she would be feeling it all and it would take all of her mental fortitude to continue moving forward. At 5K to go, if there was anything left in her legs, she could let it fly. Otherwise, just keep running. Unfortunately, Brie was feeling good and and her emotions got the better of her. Her actual pacing can be seen in the graph below. This visually illustrates what happens to many runners, first-timers and veterans alike. By going out way too hard in the early part of the race, the effort caught up with her with about 8 miles to go. The wheels had started to come off as she limped home at a 12 minute per mile pace- missing her goal time by about 15 minutes. 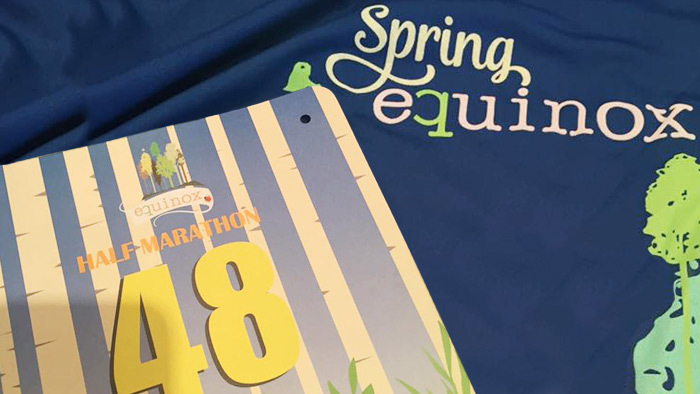 While the outcome was disappointing for both of us, it was an important lesson in pacing. Fast forward to March of this year and the the Equinox Half marathon. As an early season race, there was not a lot riding on it but it was an opportunity to see where her fitness was at and to work on that all important pacing. 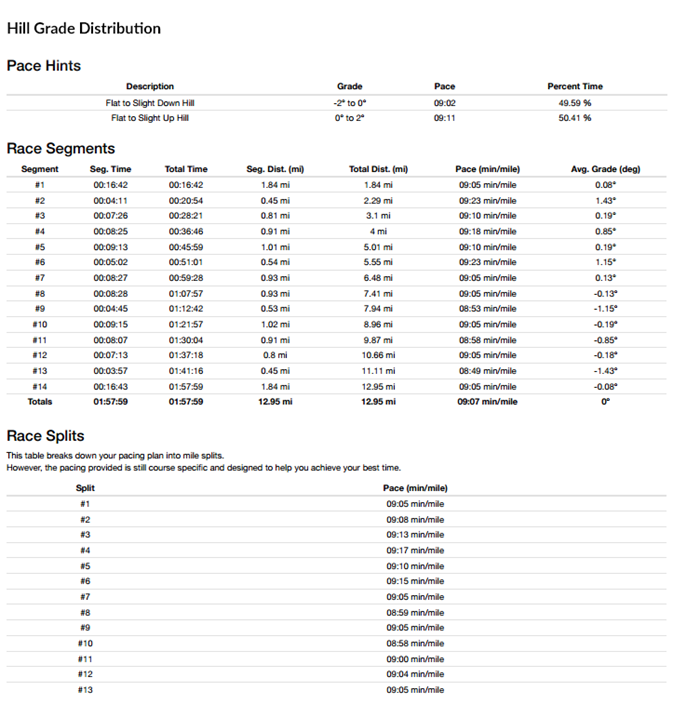 Based on her performance at the Rock and Roll Marathon in October I felt that 1:58 was a good goal for this race which I entered as the time goal on the event on her TrainingPeaks Calendar. When Brie saw this she immediately sent me an email stating that 1:58 would be a new Personal Record. I told Brie that I had full confidence that she could set a PR for this half marathon based on what I was seeing in her training runs and the fact that she the first half of her marathon in October was 1:59:20. I went on to tell her that that was five months ago and she was a completely different athlete now. That if she paced it right she should easily be able to knock off a few seconds per mile. Finally, I told her not to get too caught up in the end goal but rather focus on the pacing and the results would come. To pace this race I told her that she would want to run at her goal pace of 9/mile for the first two miles and then as it turned uphill her pace will naturally slow. I told her to pace this based on effort- not speed. If she tried to maintain the same speed then she would red line and it would be tough to recover, just focus on a steady, even effort. I went on to tell her that once she made the turn around and was heading back it was time to pick it up and let gravity do its thing. This time I also had the Pacing Project in my bag of tricks. I was able to enter the goal time and generate a plan and send it to her in an email to get her thoughts. Brie’s response was very positive. 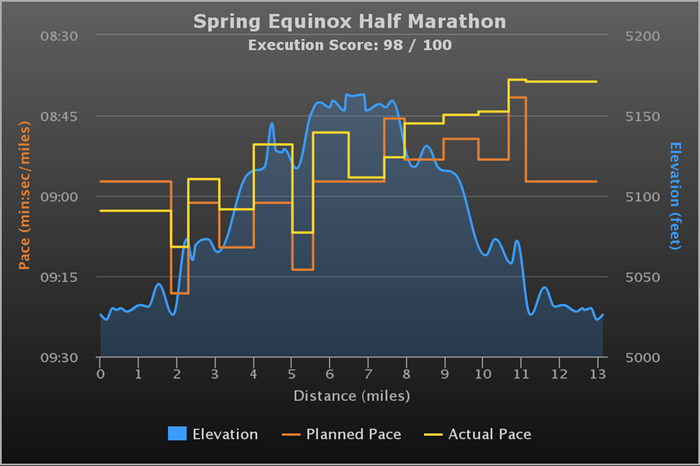 She liked the pacing plan and particularly the average grade on the Race Segments. Race day arrived and I waited anxiously for the call to see how the race went. When the call finally came not only did Brie meet her goal of a 1:58 Half marathon, but she surpassed that finishing in 1:56:09. She told me that pacing in the beginning felt easy and that when she got to the halfway point she felt great. She also noted how helpful it was to be able to see the pace laid out visually and how by holding back in the beginning she could still achieve the goal of 1:58 by expending energy where it made the most sense. Below you can see the plan in yellow overlaid with what she actually did in orange. Aside from going a bit too hard on one of the early hills she paced it very well and held back when it mattered. As mentioned before, pacing in a running race is key, but this can be complicated by early feelings of freshness and courses that aren’t perfectly flat. 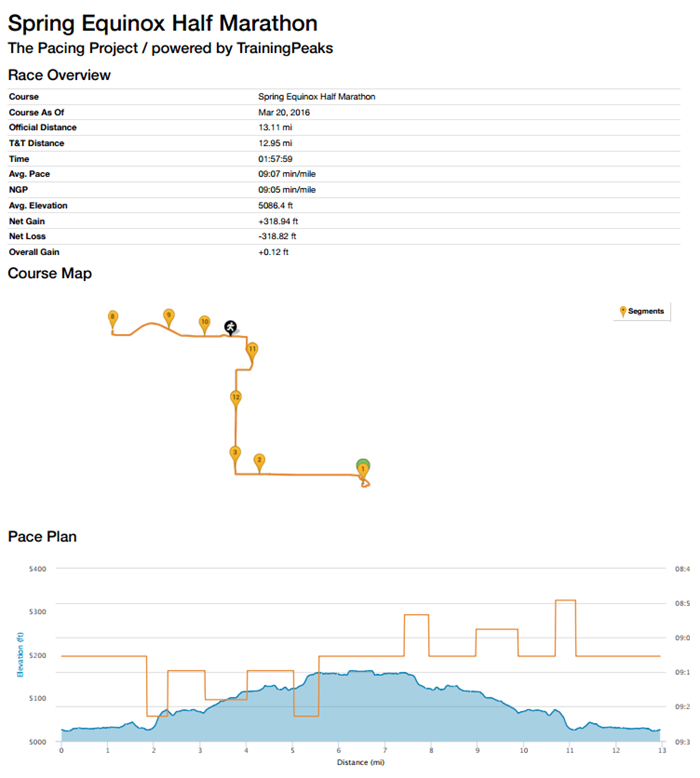 By using The Pacing Project to generate an optimal pacing plan I was able to communicate target paces to Brie, giving her the confidence to hold back and ultimately achieve her goal.